A list of the best beaches in Italy. 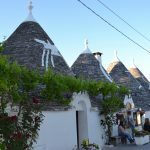 From the northern costs to the southern seaside, some of the most beautiful beaches in Italy and the stunning coastlines of this boot-shaped country in the middle of the Mediterranean. Here are 10 of Italy’s best beaches. 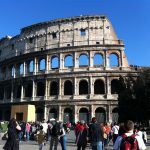 If you are travelling through Italy, your bucket list probably includes the most important tourist attractions in the cities such as Rome, Florence and Venice. But if you’re a beach lover and want to view a piece of the gorgeous Italian coast, the best beaches in Italy are not far away. Whether you prefer pebbled beaches or white sandy coast lines, if you prefer secluded bays or lively seafront holiday destinations, beautiful beaches in Italy are not hard to come by. However, most who travel to Italy don’t know where to find them. 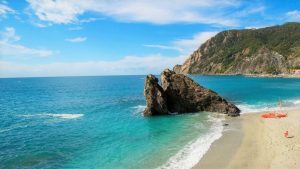 After living in this amazing country more than seven years, this is my list of the best and most beautiful beaches in Italy. Topping of my list of the best beaches in Italy is one of my personal favourites, Tropea, Calabria in the south of Italy. With the Santa Maria Church perched on top of a hill looking over the beach, this is one of the most stunning views you will witness. 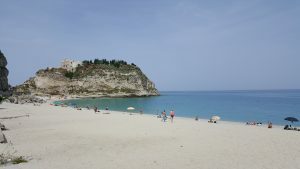 A white sandy beach, surrounded by cliffs, where Tropea old town is accessed by foot with long rows of stairs to the top. There you can look over the balcony with a view of Tropea’s beach and the hill top church. Still in Calabria, and about 30 minutes from Tropea is the unspoiled coastline of Capo Vaticano. 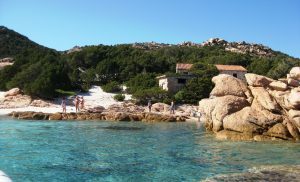 Grotticelle, one of the three little beautiful beaches in the province of Ricardi is a popular destination for Italian tourists during the Summer, and for good reason! Surrounded by coves, you can find little rock pools all along this fine white sand beach on Italy’s southern coast. Looking across to a beautiful view of Stromboli volcano, Capo Vaticano makes the perfect holiday destination for beach lovers in Italy. In a scenic little seaside town in Puglia you can find the pebbled beach of Polignano. Surrounded by limestone cliffs and with clear turquoise water this Italian beach is perfect to visit if you are exploring the area. Whether you are travelling to Italy alone, or with your family, Polignano and it’s surroundings is a must see. 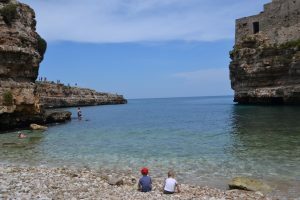 Surrounded by rock cliffs this is one of the most beautiful beaches in Puglia. Famous for the “two sisters” this twin rock has been blessed with crystal clear water and powdery white sand, surrounded by rock cliffs and green forest. What more could you want on your Italian beach holiday? Puglia’s beaches are definitely among the most beautiful and best beaches in Italy with their long stretches of golden sand. Baia Verde is one of the best beaches in Puglia and named “Green Bay” because of the sun reflecting on it’s emerald water. Gallipoli is a definite must see in Italy for beach lovers who love nature and tranquility. On the east coast of Sicily in the magical little town of Taormina lies Isola Bella, one of Italy’s most breathtaking beaches in the south. Surrounded by nature, with a small pebbled beach, Isola Bella is popular with Italian an international tourists. At the foot of the town of Taormina, travellers can take a cable car to the top of the town where you can walk around, have a coffee or gelati and enjoy the stunning views over Isola Bella from the top. Whether you are looking down at the view, or enjoying the beach itself, this is definitely one of the most stunning and beautiful beaches in Italy. The last of the five little villages that make up the Cinque Terre in Liguria, Italy is Monterosso, and the only village that has a long white sandy beach. Taking a dip in the crystal clear waters is the perfect way to finish off the day if you have taken the coastal hike of the Cinque Terre, a must see when travelling in Italy. Most travellers who visit Italy, come to Pescara for the sun, sand, and crystal clear waters. With 16kms of splendid golden sandy beaches, Pescara has the best beaches in Italy for those who love the wide open sea. Pescara itself is a popular holiday destination for Italians and international tourists because of it’s strategic location on the north east coast a short train ride away from Venice and the Italian mountains. 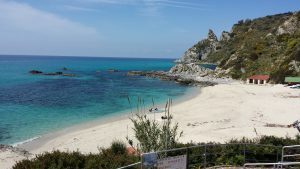 A little secret hidden in the north of Sardina is the Costa Smerelda which is known for fine sandy beaches and clear turquoise water. 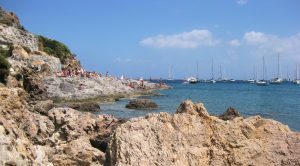 The coast itself is more of a luxury beac destination in Italy, with Porto Cervo, the main town, studded with elite hotels and shops. If you are looking for beautiful beaches, Sardinia has some of Italy’s finest. The island itself has countless beautiful seaside towns and some of the best beaches in Italy. An hour south of Rome, you can get a Ferry from the Italian town of Anzio to arrive at the island of Ponza which kind of feels like a secret only known to the Romans. I had never heard of the island and stumbled on it by chance looking at the Italian map. It’s like the Italians want to keep it for themselves. The island’s charm lies on it’s beauty and simplicity. 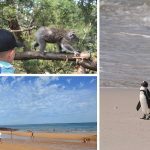 With a relaxed feel, the island is filled with rock pools, grottos, and enchanting beaches, with the most famous, Frontone Beach with it’s pristine view of the bright blue sea. 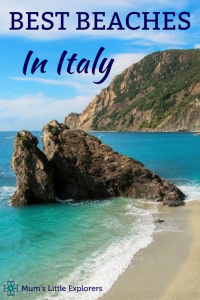 Many who travel to Italy don’t seem to venture down south, and because of this, Southern Italy has some of the most beautiful and best beaches in Italy. 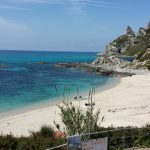 Calabria, Puglia, Sicily, and the Islands are where you will find many of the best Italian beaches, along with of course a few beaches in the north depending on what you like. Which beautiful Italian beaches are your favourites? Which seaside towns do you think have the best beaches in Italy? Let us know! 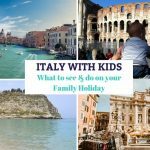 If you are travelling with kids, make sure to look at our family travel posts on Puglia, and Calabria where you can find destination tips for family travel.